We finally got ‘er done! 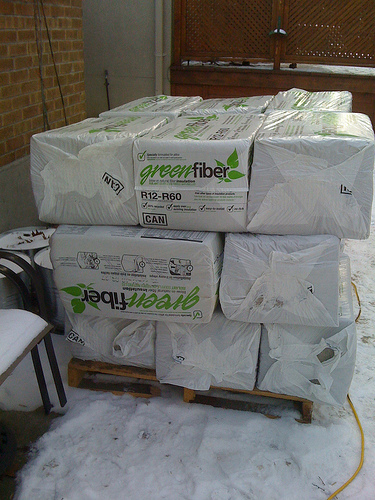 Yesterday was attic insulation day! Chris did the prep up in the attic a couple weeks ago; installed the baffles along the edges (allows for proper airflow around the roof line, above the insulation) and did some wiring we needed for a light fixture. 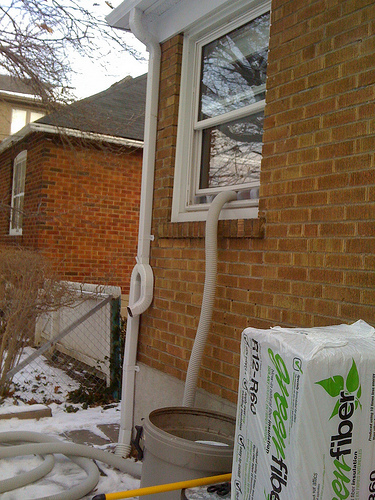 We had such a hard time finding a good day for it (it needed to be dry outside, and obviously, a day we had off), but yesterday fit the bill so we headed off to Lowe’s on Castlefield Ave in Toronto, where we’d priced the insulation and checked out the machine used to blow it in. BTW, if you live in Toronto and this is a project you are considering, go talk to Eva at Lowe’s. She was a super star! 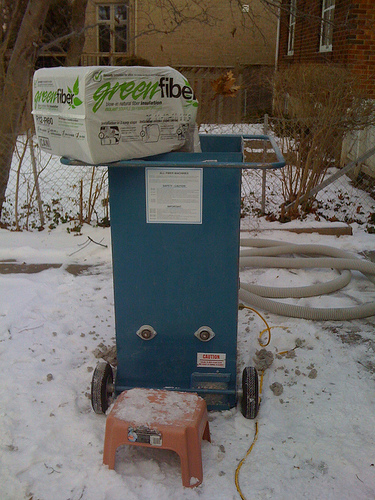 We found out when we arrived with our trailer in tow that we could just rent their truck for $20 and bring back the machine, a skid+ of insulation to our house, all in one go, instead of the multiple trips it would have taken with our little trailer (and they load it up for you with a forklift, easing some of the heavy-lifting). They give you the truck for 75 minutes, which for us was plenty of time to drive back, drop off the goods and for Chris to return it. Then we just used our trailer to take the machine back after we were all done. 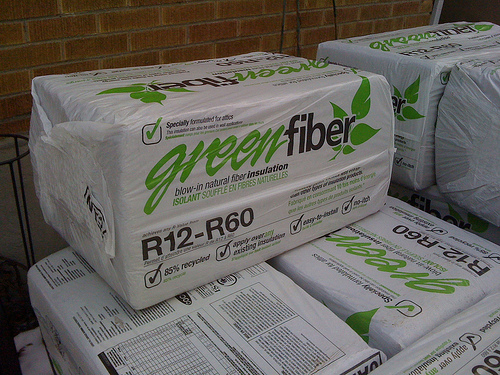 We used Green Fiber, an eco-friendly alternative to fibre glass that is easier to install on your own and quite effective. It uses something like 10x less energy to produce, is composed of 85% recycled paper and is treated with Borax to make it fire resistant. 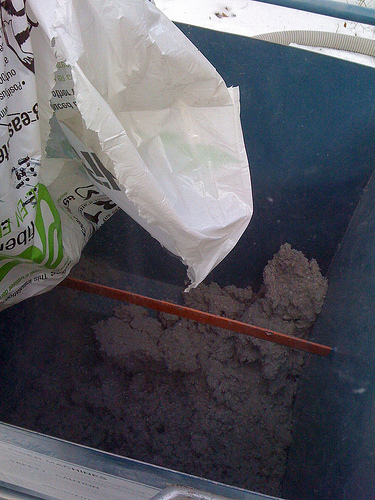 We were aiming for about R50, and Chris guessed we had about R12-13 up there already (you can put this stuff right on top of existing insulation). Oh and they throw in the use of the machine for free when you buy the insulation, after a refundable deposit. Chris got the super fun task of being perpetually crouched in the attic and not being able to see a thing because of blowing paper fibre, to do the actual blowing in of the material. I had the super fun job of hanging out feeding the machine, on the north side of our house in the shade, with a north wind (in other words it was cold). It took some practice but eventually I got the hang of feeding the machine just the right amount at a time, putting the next bale on deck and generally taking care of clogs in the tubing. Of which we had two — one minor, one major, that last one causing mucho frustration as it was getting dark and we had only 6 bales left. The clog turned out to be half way up the pipe and required taking a few things apart. 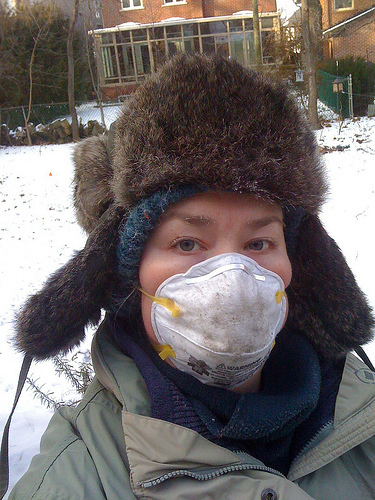 Oh and I blew insulation all over the backyard at one point. Oops! All in all, it took us under 4 hours to blow in 45 bales of the stuff. We communicated using walkie-talkies, which turned out to be essential because we were quite far away from each other and there was no way to hear one another. Yes, we own walkie-talkies… we use them for camping. Shut up! Immediately, we’ve noticed a difference in our house. It is quite simply, toasty. Where I used to feel the temperature change if it dropped by a half degree, which it did frequently, now the temperature is stable for most of the day. We have the thermostat set to drop to 14 during the work-day, and today (Thursday) while I was home on my holiday break, the actual temperature only dropped to 19 degrees! Overnight Chris said it stayed around that as well; he got up around 4 a.m. to see where it was at. I think we’ll be seeing a sharp reduction in our gas bill, for sure. And the nature of the warmth of the house is different, too. I can feel warm air around head-height when the radiators are running, which is so different than before. Chris is wondering why he didn’t do this years ago. Yes, I am wearing two hats. Literally. BTW, that isn’t frost on my eyelashes, it’s insulation fibre! we have walkie talkies too, for the cottage. And we’ve used them for soooo many other tasks like yours, they should be standard equipment! Nice job on the insulation.